(New Excalibur#19 - BTS) - Excalibur member Cain Marko (Juggernaut) met with an old friend from his criminal days, Rollo, who had agreed to meet with him as a favor to Black Tom Cassidy, who was seeking to mend fences with Cain. Rollo informed Cain that Albion had put the word out on the quiet that he was looking for those who had lost their powers on M-Day and offering them a rebirth, a chance to set things right. Rollo then handed Cain a note that would get him in the door. 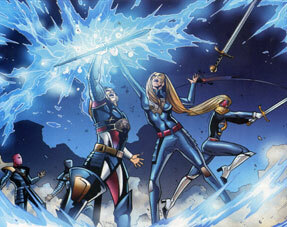 After Cain's teammates were appraised of this, Sage created a new fake persona, that of blonde depowered mutant "Diana Fox," to infiltrate Albion's new recruits. (New Excalibur#20 (fb) – BTS) – Excalibur’s Sage, undercover as “Diana Fox,” went through days of interrogation and evaluation of her loyalty and commitment in an effort to prove to Excalibur’s enemy, Albion, that she shared the same cause of Captain Britain’s destruction. (New Excalibur#20 (fb)) – Awaking in an unknown place, “Diana Fox” removed her blindfold and found herself face-to-face with Excalibur’s enemy, Albion, who had recruited numerous others to his cause as his Shadow-Captains. After Albion accepted “Diana” into the Shadow-Captains, she was tasked with finding a way to bring Captain Britain down. (New Excalibur#20) – Days later, “Diana” completed her training and accompanied Albion and the other Shadow-Captains to a government facility where they battled armed guards. During the fight, “Diana” saved Albion from an attack but afterwards, Albion questioned whether she was actually saving him or preventing the soldiers from being killed by him. He then put a sword to her throat and reminded her that he always won. He then bade her to follow him further into the facility, where Albion acquired a mystic device that would remove any electrical power within its radius. Thinking that Albion suspected her true nature as Sage, “Diana” contemplated attacking Albion until she was interrupted by the arriving Lionheart, who had returned from a battle with Excalibur. As Lionheart informed Albion that his allies, the Earth-6141 Shadow-X, had betrayed him, Albion removed the electrical dampener from its sheath and prepared to use it. Seeing this, “Diana” once again contemplated attacking Albion, gaining the notice of Lionheart, but she was interrupted once more by the arrival of government helicopters. Albion cast a spell with the device, absorbing all electrical energy into it, and “Diana” attempted to grab the device, only to be zapped by its energies. An energy wave soon engulfed all of England, removing its electrical power like an electromagnetic pulse. (New Excalibur#21) - As electrical devices halted in the wake of Albion’s spell, Excalibur were forced to team with their enemies, Shadow-X, in an effort to save lives. “Diana” eventually regained consciousness, unaware of her true Sage identity, and was surprised to see the helicopters no longer attacking. Asking what happened, “Diana” was threatened by Lionheart, who demanded to know why “Diana” had attacked Albion. “Diana” claimed that she was attempting to protect Albion from the helicopters and Albion then grabbed “Diana” by the neck, explaining that he did not trust her anymore than anyone else. Albion then announced to all of the Shadow-Captains that he had taken Britain back to its beginnings so that he could remake it in his own image. Albion next assigned Lionheart with kidnapping the Queen and her family to either recruit them or end their reign while he prepared to go to London to secure the capital and its government. As Albion and a squad of Shadow-Captains headed for London, Shadow-X’s Jean Grey caught a telepathic link with one of the Shadow-Captains and learned of Albion’s orders. In Balmoral, Scotland, Lionheart was soon met with members of Excalibur and Shadow-X while Albion and the Shadow-Captains announced to London their plans to change Britain. 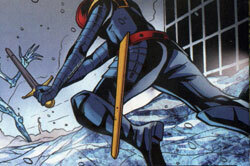 When Shadow-X’s Cyclops attempted to blast Albion, “Diana Fox” intercepted the blast with her sword. Cyclops pressed forward with his full power and Albion ordered the other Shadow-Captains to stand down, explaining to them that it was “Diana’s” battle. Eventually, Cyclops became dizzy due to the power expenditure and “Diana” caught up to him, decapitating him with her sword. (New Excalibur#22) – Happy to see “Diana’s” ruthlessness, Albion announced her to England as his newest, proudest champion: Britannia. Albion then proclaimed that he and the Shadow-Captains were England’s newest champions and that they would protect the people. Realizing that they weren’t persuading the people to their cause, Britannia asked Albion if he considered the British people a threat but he replied that they were nothing more than targets unable to fight back. He then told Britannia that the people would either accept his rule or die, asking Britannia if she thought him harsh and commenting that Lionheart would think him so. Britannia replied that she was not Lionheart and did not much care for Lionheart. Albion then explained that he had sent a team of Shadow-Captains after Shadow-X’s Angel and asked Britannia to go help them while he cemented their position in London. In order to do so, Albion once again proclaimed himself England’s new leader and had Shadow-Captains begin dispensing food and water to those without power in an effort to persuade the people to his cause. Meanwhile, some of the Shadow-Captains had caught up to Shadow-X’s Angel and Pete Wisdom, severely pummeling Angel until he crash-landed. After defeating one of the Shadow-Captains with his “hot knives,” Pete rushed to aid Angel against three other Shadow-Captains. Dazzler, Juggernaut and Shadow-X’s Iceman and Beast soon arrived and a fierce battle against the Shadow-Captains ensued. Britannia arrived shortly thereafter, eventually killing the Beast before being attacked by Juggernaut and Dazzler. The Shadow-Captains soon grabbed up Britannia and retreated. (New Excalibur#23) – A Shadow-Captain named Derek Petrie broke into a building 70 stories up to use the bathroom and was knocked unconscious by Excalibur’s Nocturne, who had possessed her doctor and then possessed the Shadow-Captain himself. Using Petrie’s body as her own, Nocturne flew back to Albion and the other Shadow-Captains just as Excalibur and the remaining Shadow-X mounted a full scale assault on Albion’s forces, riding into battle on a massive ice slide generated by Shadow-X’s Iceman. Attempting to subtly remind Sage of her true nature, Nocturne, in Petrie’s body, asked Britannia that his home was out there and asked what would happen to the people during the upcoming battle. Britannia just told Petrie to fight to win as the battle began. Albion then ordered Britannia to remain by his side as the Shadow-Captains rushed to meet their incoming enemies. As the battle progressed, Iceman kept many Shadow-Captains at bay with ice while Jean Grey telekinetically battered others with debris, even brutally torturing one of them telepathically. Some of the Shadow-Captains caught up to Shadow-X’s Angel, stabbing him, while Albion covered Britannia’s eyes to shield them from Dazzler’s light. 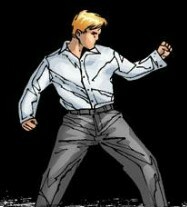 Iceman continued to repel Shadow-Captains, aiding Juggernaut in taking down several of them, and Pete Wisdom was saved from a fatal stabbing by the injured Angel. A Shadow-Captain eventually cut off one of Angel’s wings and tossed him from Iceman’s slide to his death, prompting Jean Grey to brutally stab the Shadow-Captain with a telekinetic sword. Albion rushed to Jean, preparing to kill her, but she was saved by Captain Britain, who began a brutal fight with Albion. 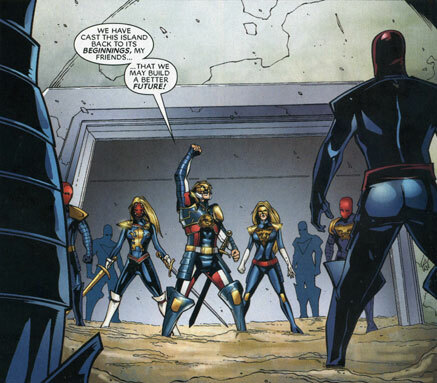 During the fight, Captain Britain attempted to remind Sage of her true nature, and both Captain Britain and Albion were unmasked, revealing the same face. (New Excalibur#24) – Nocturne, still in the Shadow-Captain Petrie’s body, along with the other Excalibur members, were shocked at Albion’s true face. Flying into the fray, Nocturne used Petrie’s body to attack Albion, who slammed Petrie into the ground, the shock of which restored Nocturne to her own body. Leaving Petrie, back in control of his own body, to deal with Nocturne, Albion departed to continue the fight against Captain Britain. Before he could kill Nocturne, Petrie was blasted by Jean Grey, whom Petrie stabbed with his sword. Jean knocked Petrie away while Lionheart took the fight to Britannia, soon joined by Juggernaut and Dazzler. Sage soon came to her senses while Iceman began withering due to the large amount of body moisture he was using to repel the Shadow-Captains, killing one of them named Ricky. Lionheart soon arrived and attempted to convince some of the Shadow-Captains to see the error of their alliance with Albion but they labeled Lionheart a traitor and attacked her as well. Telepathically snagging one of the Shadow-Captains’ memories, Jean Grey and Nocturne visited the government complex where Albion had cast his spell to eliminate all electrical power while Captain Britain continued fighting Albion personally. Sage, back in her right mind, soon arrived with Excalibur to battle Albion. Jean Grey and Nocturne also arrived, carrying with them the mystic device Albion had used to remove electrical power. Jean then died as Captain Britain destroyed the device, restoring power to Britain. His plan ruined, Albion was defeated by the heroes and Lionheart was later reunited with her family. Comments: Created by Chris Claremont, Jeremy Haun, Dave Meikis and Sean Parsons. For the most part the Shadow-Captains were depowered Earth-616 mutants, who were recruited by Albion and through technology inside their costumes received the powers of flight, superhuman strength and durability. Though one of them called Angel a mutie in #23, his prejudice suggesting he might not have been a former mutant, but he might have just been jealous. Derek Petrie was one of the Shadow-Captains who had stopped to use the bathroom and was possessed by Nocturne. 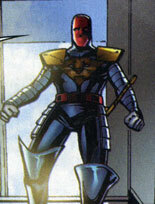 Using his body, Nocturne flew back to the other Shadow-Captains until Albion was revealed as an alternate reality counterpart of Captain Britain. Taking that time to attack, Nocturne was knocked into the ground, restoring her to her own body and returning Petrie’s mental faculties. Albion ordered Petrie to kill Nocturne but she was rescued by Shadow-X’s Jean Grey, whom Petrie stabbed. Jean telekinetically knocked Petrie away, allowing herself and Nocturne to escape. Ricky was one of the many Shadow-Captains attacking Shadow-X’s Iceman during the final battle against Albion. During the fight, Ricky was frozen and shattered by Iceman just as Lionheart arrived to attempt to convince the Shadow-Captains to see the error of their alliance with Albion. Rupert was one of the people in London when Albion arrived and announced that he was England’s new leader. Rupert was asked by prime minister Tony Blair to start distributing food and help set up stations along the River Thames.